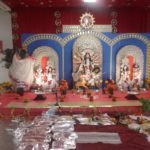 During late October, I went to my first Durja puja celebration. 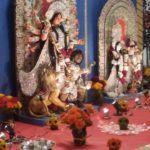 I am trying to learn more about it because I am going to the large Kolkata celebration in October 2017. While the other food was not the best, this prasad that was given to the participants after the ceremony was delightfully unique and sweet. There were a lot of sweets at this celebration, but this was my favorite. After doing a puja or prayer with the Hindu priest, that involved throwing flowers towards the goddess on the pandal, a group of volunteers spooned out this fragrant loveliness in an assembly line buffet fashion. 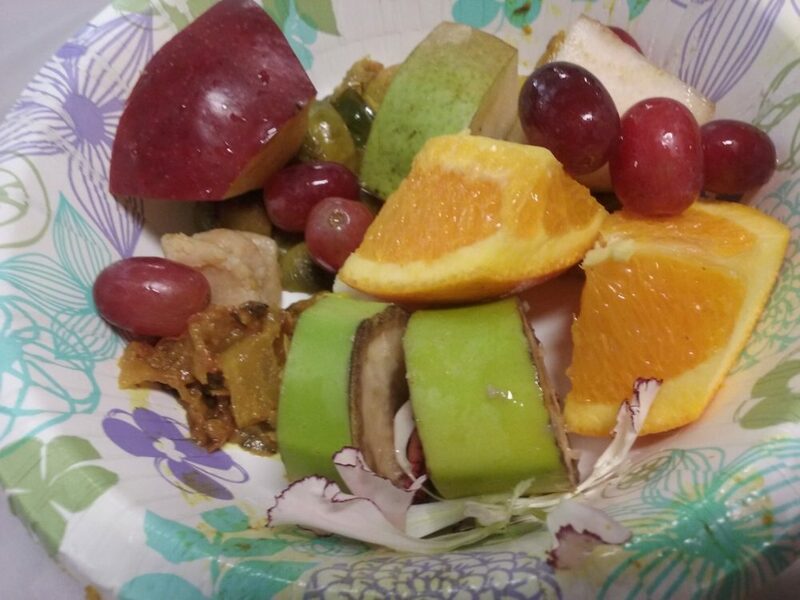 This nice fruit bowl of orange, grapes, apples, and bananas also included a flower, some nutty sugary sweet and my favorite, a spoonful of sugary cinnamon pickle. All of this combined delivered an array of spice and sweetness for my taste buds. The varying fruit juices mingled with the sugary, nutty and cinnamon flavors to produce an addictive, delectable sweet. In India, after visiting a temple, you are given a piece of blessed food to connect with the spiritual experience. This prasad can range from anything from a handful of nuts to a sit down meal to complete your spiritual visit. This bowl of sweet was the perfect ending to seeing the Durga pandal for the festival.